It's Halloween tonight and I am just not excited. I was never a big fan of Halloween. I remember some of my costumes. I remember it being cold most of the years. I remember the candy but I was never a big fan of candy. I like chocolate. I think even as a young child I was particular about my dessert preferences. If you asked my parents I am sure they would tell you I was particular about many things growing up but that is another story. Here are my Halloween decorations, even though I think of them more as fall decorations. For Halloween they are somewhat lame - Jordan is still trying to convince me to cut them up and put a candle in them tonight. As fall decorations though I can keep them through November and eventually chop them up to eat the pumpkin and roast the seeds. I did buy some candy although the only child indulging will be Jordan. I hope it last at least through he week. I definitely see some late night stomachaches in our future. Now I meant today's post to be full of the fun things we did yesterday to celebrate our two month anniversary. We went to Aspen. No, not the city but the restaurant in Old Saybrook, CT. It was so good yet I forgot to take any pictures. I was so happy to remember the camera. But as the appetizer came out of calamari I completely forgot to take any pictures until we had finished it all off. An empty plate is never a fun picture. I can explain our forgetfulness because of our hunger. It was about 12:15pm at this point. I had an awful night on sleep Friday. I had to wake up early to go to the DMV once again this year. I am officially documented now as Mrs. Morris :) on my driver's license. But my breakfast was just a wimpy Peanut butter on wheat bread on the run. Nothing compared to my yummy bowls of oatmeal I have gotten used to. So basically starving for food I was fully focused on eating and not picture taking. Immediately after we had finished I remember my whole blog about this meal idea. I told Jordan to help me remember about the rest of the meal but then we were again eating away till there was no more food. I actually only ate 1/2 of my sandwich but at that point the presentation just was not there. I had a pork loin sandwich with fries and Jordan had the burger of the day with avocados, roasted tomatoes and homemade pickles. The idea was to each eat 1/2 and then switch. I had a few bites of Jordan's but then he finished it. I still have mostly my half of the pork sandwich left after Jordan sampled a few bites. It was good and we might go back. It was fun to try a new restaurant and I am very disappointed I didn't get any pictures. Their presentation was quite attractive. I love it when my food looks good. And that was only part of it. I think this is an abnormal amount of laundry for two people. The whole day probably amounted to about 6 loads of laundry. Is that possible? Thanksgiving cannot come soon enough! Thank goodness it is Friday. It has been a long, long week full of work and very strange weather. We have eaten well though. Two nights ago Jordan and I created this semi-Thanksgiving meal. It was the first squash of the season for us. Plus we had some wild rice and it was so good. I added dried cranberries and cashews to mine. I cannot wait for Thanksgiving. The weather is finally turning chilly - probably a bit too chilly but still. Today also marked my two month wedding anniversary. Our pictures arrived via CD disc in the mail and I cannot wait to share them with you. Tomorrow I am official getting my name changed on my driver's license. Oh my, what a big change. We are also celebrating at a new restaurant. More posting to come soon. Jordan loves hot things, by that I mean spicy. He loves chicken wings. Lately he has been into trying to find the best recipe for chicken wing sauce. After a recent trip to Maine we returned with some habanero peppers. With these hanging over his head he had to find a recipe to incorporate them. He was completely in charge of this dinner. I try not to be around when he is experimenting in the kitchen. All I can say is the end result was good, good until about two minutes in when I stopped having feeling on my lips. Basically an inch out around my face was all tingly. Jordan was so impress with the results. Normally when I have breakfast for dinner it is because there is no "normal" dinner food to have. This week however I was able to buy some nifty pancake and waffle mix at the fun new Natural Food store I found. It was a whole grain Bob's Red Mill mix. For my bridal shower way back when I got a Cuisinart Belgium waffle maker. I have been wanting to try it out for quite some time. But things were so very busy. I also have this issue with my weekend mornings. I like to have a light breakfast on Saturdays and Sundays and then go for a nice run. Big waffle breakfasts do not go good with runs. So weeks passed and no waffles to try. Once I had my hands on the mix though it was just a matter of time before the waffle maker would get tested. The batter took all of two minutes to whip up. One batch took the whole waffle maker or I suppose I should say the waffle maker took one whole batch of mix. Against my better judgement Jordan convinced me that we each needed our own 4 pack of waffles.. I made each square with a different topping, maple syrup, apricot jam, and almond butter. Jordan mounded his with butter and maple syrup. It was good! Now I am stuffed though. My stomach is quite heavy and I remember now why I don't go to eat this on the weekends before my run. It's Monday and the perfect time for another crock pot creation. Jordan was in charge of this one. He cut of the ingredients on Sunday afternoon. Put in 1/2 of the mixture at lunch time and then finished it off at 5pm. Not the most convenient for those who work far away from home, but it worked for us tonight. See how nice a wife I am? I laid out all of the ingredients for Jordan so he would be all ready to throw them into the pot. 1. Brown beef in oil in sauce pan. Transfer to slow cooker. 2. Combine soy sauce, garlic, onions, sugar, and spices. Pour over meat in slow cooker. 3. Cover and cook on low for 5 hours. 4. Add green peppers and tomatoes. Cook for 1 more hour. 5. Serve over rice or noodles. Over all it was very good. I added a 1/2 C water with the meat because it makes me nervous to have the crock pot on when I am not home especially when there is no liquid. The taste was really good however for me an ideal crock pot recipe is throw it all in and let it cook. This dish had way too many pots. The multiple additions would have been impossible if we didn't live so close to the office. We had ours with egg noodles. Overall it was a success and there are plenty of leftovers for lunch tomorrow. Jordan and I always try to have Sunday night dinners as something special. When I was planning this meal I was thinking something special. I had been eyeing brussel sprouts at the grocery store for the past couple of weeks. They are one of the few things which are pretty common that I can say I have never tasted. My dad doesn't like them and we never had them growing up. The strange part is I am not tainted by my dad's disliking in any way. I just have no clue how they taste. I asked Jordan about them and his dad doesn't like them either. Turns out his mom makes them for herself but only steams them. The look of steamed brussel sprouts never appealed to Jordan so he didn't eat them either. Well, we decided to give them a try. After a little only research by Jordan we decided something very simple. Cut off the bases. Mix with olive oil ought to coat the each brussel sprout. Salt and pepper to taste. Bake for 30-45 minutes in an oven heated to 400 degrees. Toss around 1/2 through cooking time. They were very, very good and we plan to have them again. The crispy brown portions were the best! I love it how every time I make pork chops I think my looks like a state. For the most part they all look like Texas but it really struck me tonight. So sad it is time for work again. One more week and things should start to slow down. I am in the state of Connecticut though for the whole week. Perfect timing for the new bed - I actually get to enjoy it. Homemade polenta for the first time and it was delicious. I haven't felt healthy for a while. Pretty much since the honeymoon I have been hunkered down doing lots and lots of work. Some was just organizing the apartment, continuing to move in, and settle from the wedding. Lots of it was from work, work. I have been gone every week for at least 1 day for the last 2 months. Most weeks it was more like 3 or 4 days. Let's just say it has gotten to me and twice already I have been sick. I hate being sick. I truly believe in the holistic methods of healing and well part of that is nutrition. I haven't been eating so horribly but I have been having lots of sweets. The goal for the coming future is to have more fruits and veggies, less sweets. That is like 10 servings in and of itself and Jordan and I had fair portions to begin with. I think I am going to make corn muffins with some of the extra. Hopefully it will turn out alright. I don't know how we will eat all of this. The excitement of the day though was the bed delivery. Now I know this just looks like any old bed picture but really it is heaven. Its about 1 foot higher than the previous mattress and we have a box spring now. It is so wonderful! YUM-O! So many sweets are available to me right now I just don't know what to do. But that is not the most exciting thing going on in my life right now. I found myself in a little trouble on the way home from the gym I stopped by this natural food store that is on the way home. When we lived here before it was at a different location. It was dark and dingy, not at all the atmosphere I like to buy my food in. I never ended up shopping there. Fast forward two years later and its up in a new building on a hill. I still had the old memories dancing in my head so 4 months latter I have yet to stop by. Yesterday though I found an ad in the local paper with a 15% off coupon. Oh my, with that in hand I couldn't help but take a gander. The seemingly small stop from the outside was actually quite large. They had a fair amount of groceries, veggies, frozen foods as well as a small deli in the back for coffee and sandwiches. Not only was there a fairy large bulk section with good prices, they also had some of my old to find favorites. This is where the trouble came in...within 5 minutes I had snagged $20 worth of goods. This can not be a regular occurrence. I am excited about the bulk section though. I love to buy grains in bulk. Not only is it cheaper but Jordan is not a huge fan of some of my fancy grain side dishes. Thus, I can sample new recipes with just the exact amount and not worry about having tons of extra if Jordan hates it. Today is also the day the new mattress comes. Jordan and I got a new mattress last weekend and had to wait all week for the delivery. I cannot wait for it to come. Until then ( I have about 2 more hours to go before the scheduled time frame) I am cleaning, organizing, and preparing for the holidays. Yep, I am ready. It is cold outside and that means Thanksgiving is just around the corner. That means dinner menus need to be made and grocery lists need to me wrote out. I can't be short an ingredient come Thanksgiving morning. And yes this has happened before. It is quite the drive out of Turner, Maine to find a store opened on Thanksgiving. Anyway, I get pure pleasure out of this practice and thus I am thoroughly enjoying my Saturday. I was visiting Duke University this week. I love going to Durham, NC. We stay at a sweet hotel, eat lunch at whole foods, and visit yummy restaurants. This trip did not turn out quite as expected - more on that later. Anyway, before I left I was in the midst of enjoying fall. Work held a fall themed potluck just after I got back and I decided to bring cinnamon cookies. I think cinnamon is just a warm flavor perfect for cool days. 2. Beat butter, brown sugar, and white sugar till creamy in mixer. Add eggs one at a time and vanilla and mix till well combined. Scrap down sides and mix again. 3. Add flour and baking soda mixture to butter mixture and combine. Slowly mix add in oatmeal and then cinnamon chips. The batter is very thick, but makes for fluffy cookies. I would recommend some kind of mixer such as a Kitchen Aid. Your muscle will take a beating if mixing by hand. 4. Drop a tsp of dough on to cookie sheet. Bake for 10-12 minutes or until lightly brown. I forgot to take picture right away and before I knew it the tray looked like this. I will say in defense of myself and Jordan that I only made 15 total and they were very bite size. What can I say, they were super scrumptious. I have a thing for miniatures. I truly believe good things come in small packages. I have always loved mini pumpkins. Being in an apartment makes it hard to justify huge pumpkins. We don't really have a front stoop or a deck or a yard. Thus whatever we get for pumpkins are for the inside. Furthermore I don't really enjoy carving pumpkins. The only reason for me to cut one up is to get the seeds to roast or the meat to make bread or pie with. But really they are so cute whole why disturb such a pretty sight. As I cleaned through our stack (mountain) of important papers, the table got more and more space for a centerpiece. Perfect time for the fall decorations to come out. I haven't quite got the perfect arrangement just yet but it makes things feel much more cozy for fall. I get a kick out of celebrity sightings. I cannot say that I have that many under my belt. There is a story that when I was very little and living in Georgia Kenny Rogers opened the door of a mall for my mom and I. I saw Scotty Pippen a few times in Disney World during ESPN weekend. But that is about it. One of the biggest disappointments I have from Paris is learning that the crew of the Today show was at the Louvre with the cast from Da Vinci's code right before the movie came out. I found out 24 hours too late. 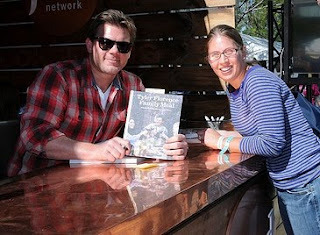 Having tickets to the Food and Wine festival meant being able to see various celebrity chefs and book signings. 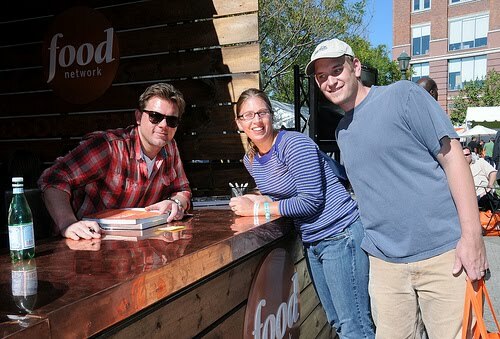 During our time in the festival square we saw Tyler Florence, Rachel Ray, and Giada Di Laurentis. Now for me I was pretty excited about this, I watch them on TV, I use there recipes and here they are within a few feet of me. They have some pretty strict rules about what they do and do not allow at these signings. Only certain books will be held up for pictures. Some chefs would only personalize the most current book. Some chefs would not look directly at the camera for photos. You also could not take your own photographs when up near the front of the line. I got a bit sneaky and got one of Susie Fogelson, SVP Marketing, Creative Services & Brand Strategy from a distance. She was one of the judges from the Next Food Network Star. She was super tiny in person. Tyler showed up in flannel with his wife. And Rachel is super short. She was quite bubbly though just as on TV. It was fun to see all of the stars. I was a little disappointed though with all of the rules and regulations. We are the fans, we make you popular but yet it was one thing after the next when all I wanted was a book signed. I am a foodie and I don't even think you are that big of a celebrity. Sunday morning brought a new day of sunshine even if it was a bit brisk. Jordan woke up feeling much better thank goodness. I went easy on him though and let this weekend slide with the chores. Hopefully he can keep the apartment clean this week when I am gone so next weekend won't be a cleaning fest again. I was spoiled this past week with being in New York City. There is good food everywhere. I spent my mornings have super yummy muffins at City Bakery. Lunches were a varied bunch at Whole Foods in Union Square. Add an occasional cookie from the Farmer's Market and let's just say I ate very well. On the way home I grabbed this wonderful loaf of Multi-grain bread from Zaro's. I have only been to the store at Grand Central but I think their breads are wonderful. Add one banana smashed on top and let's call it heaven. Why is the weekend over already?